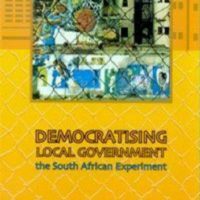 First published in 2002 Democratising Local Government: The South African Experiment edited by Susan Parnell, Edgar Pieterse, Mark Swilling and Dominique Wooldridge is now available through open access. Local government is at the forefront of development. In South Africa the ambitious policy objectives of post-apartheid reconstruction and development hinge on the successful creation of a democratic tier of government close to the people. An entirely new system of ‘developmental local government’ has thus been introduced. As is the case in many developing countries, the responsibilities of municipalities in South Africa have been extended dramatically, often without adequate resources. Managing municipalities for development therefore requires political will and strategic intervention. The book provides a comprehensive introduction to developmental local government. It includes: the design of the new local government system and the issues posed by decentralisation; an overview of specific challenges of urban and rural municipalities; a discussion of special issues facing local government including poverty, gender and environment; new tools for local government, including budgeting, indicators, municipal partnerships and capacity building. Democratising Local Government: The South African Experiment by is licensed under a Creative Commons Attribution-NonCommercial-NoDerivs 3.0 Unported License.